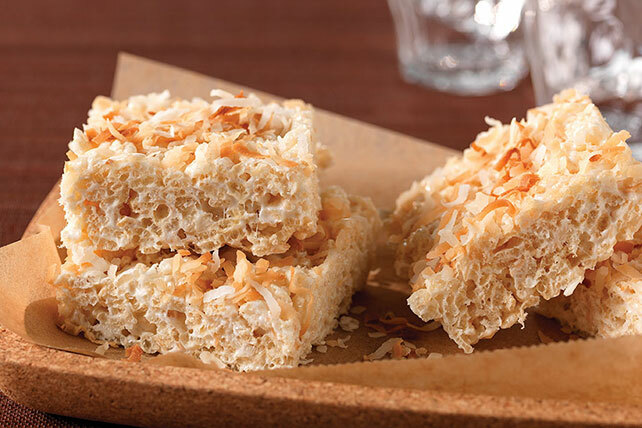 If you’re a fan of coconut, these Coconut RICE KRISPIES TREATS® are a MUST try. At least, that’s what one reviewer said—and we completely agree! ®, TM, © 2013 Kellogg NA Co.
Microwave butter in large microwaveable bowl on HIGH 45 sec. or until melted. Add marshmallows; toss to coat. Microwave 1-1/2 min. or until marshmallows are completely melted and mixture is well blended, stirring after 45 sec. Add cereal and 1 cup coconut; mix well. Press onto bottom of 13x9-inch pan sprayed with cooking spray. Top with remaining coconut; press lightly into cereal mixture to secure. Cool completely before cutting into squares. Sweets can add enjoyment to a balanced diet, but remember to keep tabs on portions. One serving of this dessert is one square.